CLAPA Lottery Player Scoops the Jackpot! PPS were delighted to celebrate their latest Weather Lottery jackpot winner recently, when a supporter of the Cleft Lip & Palate Association matched all six numbers and scooped the top prize. When Mary Howlett of Leicester checked her lucky numbers of 2,8,3,1,5 and 7, she was over the moon to discover she’d just won £25,000. Retired nurse, Mary, had been playing the CLAPA lottery for many years, knowing that money raised from the lottery directly helps the charity so close to her heart. Image above: Mrs Howlett’s son, Peter, and grandson, Sam, collecting the cheque on her behalf. For Mary, CLAPA has always been a special charity for her, as her grandson, Sam, was the first baby diagnosed with a cleft lip and palate at Basildon Hospital. And since that day, the charity had been fantastic with providing support and information. Not only has Mary been supporting CLAPA for several years by playing their lottery, but in a very generous gesture, she decided to donate £2,000 of her winnings straight to CLAPA! 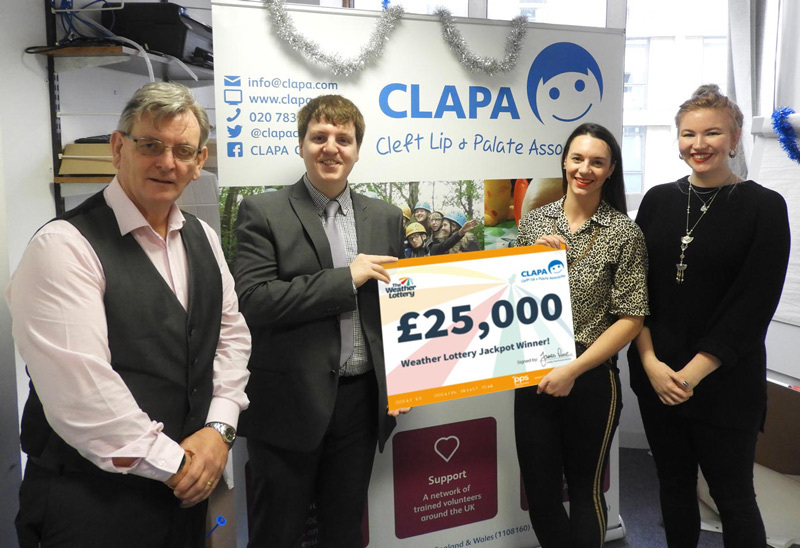 Hundreds of charities and societies have their own lotteries, and CLAPA are just the latest to have one of their supporters win the £25,000 top prize. The Weather Lottery is Britain’s favourite charity lottery, and has raised over £5m over the many years. If you would like to play a lottery and support a cause close to your heart, choose from the many Weather Lottery societies here. With every pound you play with, half goes to directly to the charity, so they can continue their fantastic work. Alternatively, if you manage a charity, society, trust, school or hospital, you too could have your own lottery. Imagine if one your supporters won the jackpot! A lottery is a proven method of fundraising, just ask the team at CLAPA! If you want more information about launching your own lottery, contact us today. We regularly update our website with articles about lottery fundraising which we hope you find interesting and informative.